Gluten is a protein found in the endosperm of grains such as wheat, rye, spelt and barley. It constitutes about 80% of the proteins in wheat, and is composed of the proteins gliadin and glutenin. Gluten is also used as a food additive in the form of a flavoring, stabilizing or thickening agent found in ice cream, soy sauce, ketchup, beer and many other items. Gluten also provides elasticity to dough, which gives breads and bagels their chewiness. A person does not have to be diagnosed with celiac disease to suffer the damaging, harmful effects of gluten. Gluten intolerance or gluten sensitivity is an inflammatory, immune response to gluten. Gluten is found in grains such as wheat, spelt, kamut, oats (unless designated gluten-free), rye, and barley (and hidden in many other products). Those suffering from non-celiac wheat sensitivity (NCWS) have celiac-like gastrointestinal symptoms, a weak intestinal barrier, leaky gut, and also fatigue, cognitive issues like brain fog, memory loss, and experience more anxiety, depression and mood disturbances. Both celiac disease and gluten intolerance tend to be more common among people of Scandinavian, Irish, English, Scottish, and Eastern European, although gluten has negative consequences for just about everybody. Eating gluten has a damaging affect on your health causing chronic inflammation, intestinal permeability (aka leaky gut), gut irritation and destruction, compromised immune function, mood disorders, increases risk of autoimmune diseases, thyroid dysfunction, and negatively affects nerves, joints and brain function increasing risk of memory loss, brain fog, and neurological conditions. Even more astonishing is a review published in the New England Journal of Medicine that listed over 55 diseases caused by gluten! Many of the diseases are neurological and psychiatric including anxiety, migraines, epilepsy, neuropathy, schizophrenia, dementia, depression, and autism. The National Library of Medicine has found over 200 adverse health effects linked to gluten-containing grains. Gluten has adverse neurological and cognitive consequences following ingestion. Gluten destroys the brain and nervous tissue more than any other tissue in the body, including the GI tract. Scientists at the University of Maryland, School of Medicine’s Center for Celiac Research have proven that gluten sensitivity is different from celiac disease at the molecular level and in the response it elicits from the immune system. The research, published in BMC Medicine provides the first scientific evidence of a different method that leads to gluten sensitivity. Alessio Fasano, MD, a leading expert in gluten quoted in an article for Scientific American, “a person whose immune system has managed to tolerate gluten for many years might suddenly lose tolerance if the microbiome (gut flora) changes in a way that causes formerly quiet susceptibility genes to become active.” Chronic stress and other factors may also turn on the susceptibility genes. The amount of gluten in wheat today is 2-3 times what it used to be, and wheat is genetically modified, which is a direct cause of autoimmune disorders, inflammation, bloating, constipation, diarrhea, digestive problems, leaky gut, depression, anxiety, skin disorders, and excess weight. It can take up to 6 months just to bring down the autoimmune-inflammatory antibodies of eating a gluten-containing food just one time! So, eliminating gluten, wheat or any other inflammatory food item for only a week or a month in some cases may not be long enough to see symptom reversal. Gluten also contains opiate-like compounds called gliadorphins or exorphins that mimic the addictive and debilitating effects of opiate drugs like heroin and morphine. Grain’s exorphins can create addiction. Like morphine, exorphins bind to opioid receptors that are found throughout the body. Most people have an opiate peptide issue with gluten that triggers cravings and addiction to gluten-containing products. When these individuals give up gluten, they tend to experience withdrawal symptoms such as headaches, fatigue and irritability. If wheat can affect the brain, it should come as no surprise that it can affect mental health too! disease is associated with an increased risk of depression and psychosis. Bread is the very symbol of food, and learning that it can threaten your mental well-being may come as a shock to many. And, it’s not just the bread and pasta — other foods such as milk, rice and corn also release exorphins during digestion. Need another reason to stay away from gluten-containing grains? All grains are sprayed with RoundUp (glyphosate), a potent carcinogen, an excitotoxin to the brain, a toxic antibiotic that kills good bacteria, disrupts gut bacteria and alters the microbiome. Besides wheat and grains, glyphosate is applied on barley, oats, canola, sunflower, flax, peas, soy beans, lentils, dry beans and sugar cane. RoundUp is destructive to the gut, liver, kidney, brain, immune system, and is linked to a myriad of chronic illnesses. RoundUp is a chelating agent, particularly chelating vital trace minerals such as magnesium, manganese, iron, molybdenum and colbalt from the body. All grains have elevated levels of mycotoxins, which are endocrine disruptors. When you eat gluten and foods that your body is sensitive to inflammation increases in the brain and the gut! If you’ve been diagnosed with Hashimoto’s, thyroid dysfunction an autoimmune disease, depression, ADHD, autism or if you experience headaches, bloating, weight loss resistance, aches and pains, digestive problems, constipation or diarrhea, anxiety or depression, completely eliminating wheat and gluten-containing items is one of the smartest choices you can make. An article published in Health Psychology Review noticed dramatic remission in those with in mood, attention (ADD and ADHD) and autistic disorders when gluten was eliminated. More research published in the journal Psychiatry Research found that sensitivity to gliadin (the protein found in wheat), could be driving some people into states of acute mania. Success Story. One of my clients, a 38 year old male, was diagnosed by his physician with rheumatoid arthritis. Upon my suggestion, he completely eliminated gluten, wheat and other inflammatory foods from his diet. He’d been on numerous prescription drugs (some with awful side effects). Initially, he experienced fatigue and headaches. By the second week of his gluten- and wheat-free diet, he could not believe the incredible transformation and how much better he felt. This specific client also had four underlying infections including Candida overgrowth, Klebsiella, yeast and parasites. After years of pain and suffering, over the course of four months the joint pain, digestive distress, fatigue and brain fog disappeared. He no longer takes any pharmaceutical drugs and is completely pain-free! Gluten intolerance is an inability to digest the protein portion of grains (wheat, rye, barley, spelt and oats). 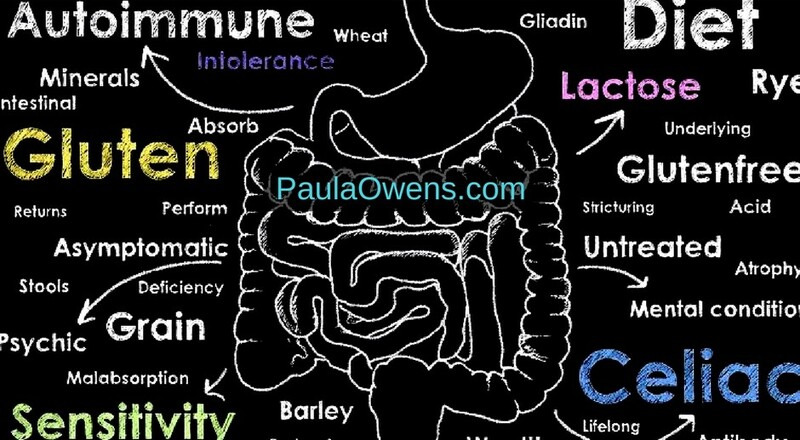 In those who are gluten intolerant, these grains cause a reaction in the intestines that sets off various symptoms. Often it goes undiagnosed because the reaction can appear 12-24 hours after eating gluten. 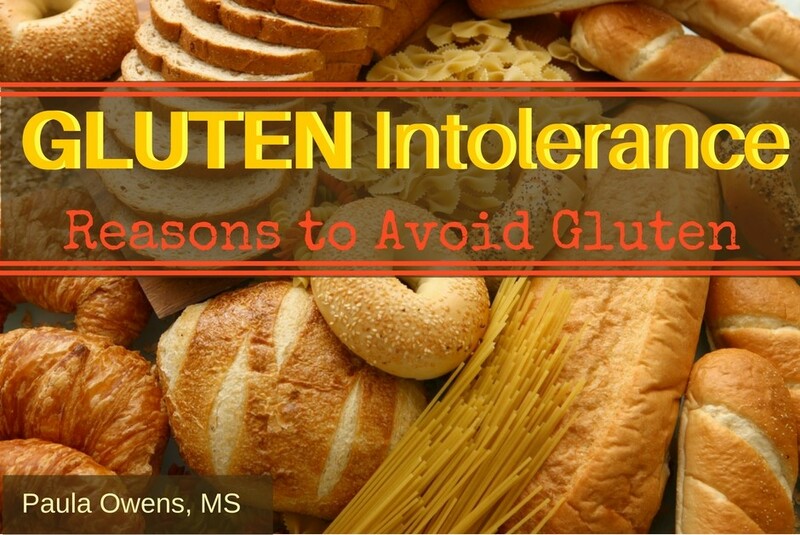 Gluten intolerance causes multiple nutritional deficiencies and inhibits absorption of nutrients. Wheat raises blood glucose higher than almost all other foods…higher than a Milky Way bar or a Snickers bar. Symptoms and conditions linked to gluten intolerance can be different for each person. Children may experience allergies, asthma, anemia, a constant upset stomach, insomnia, ADHD, or milk (dairy) intolerance. Following a gluten-free diet is best for most people. Always read the list of ingredients. Gluten is in every grain except rice, amaranth, buckwheat and quinoa (which is actually a seed). Some labels reveal if the product contains gluten, but most do not. Usually the more processed a food item is (often evidenced by a long ingredient list), more than likely it contains some gluten. Just because a product is labeled gluten-free does not mean it’s a healthier option. An organic, gluten-free cookie loaded with sugar, potato starch and rice flour may have fewer pesticides, but it’s still processed junk food that spikes insulin. The majority of gluten-free products are processed junk food designed with clever marketing designs. Breads, cereals, cookies, muffins, chips, etc. that are labeled as gluten-free typically replace wheat with potato starch, soy flour, tapioca starch, sorghum, rice and corn (flour) starch, which quickly metabolize into sugar, spike insulin, increase inflammation, and cravings. Healthier alternatives include coconut flour or blanched almond flour. Just eat real food folks! Gluten cross-contamination is when gluten comes into contact with gluten-free foods and contaminates it. This can be problematic if you have celiac disease, gluten intolerance or gluten sensitivity, and you find that your gluten-free diet is not making you better. You may want to consider the possibility of cross-contamination. While eliminating gluten from your diet will alleviate various symptoms for most, I encourage people to see qualified medical professional for a Celiac panel (Cyrex Labs) for a proper diagnosis to rule out celiac disease. Most individuals receive incomplete testing for gluten intolerance and are often misdiagnosed. Cyrex Labs is a trusted lab and the Gold Standard of lab testing that tracks and detects gut permeability, gluten intolerance and gluten sensitivity. Are Your Symptoms Related to Food?